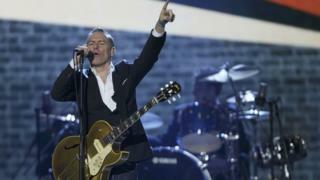 Bryan Adams has cancelled a concert in Mississippi over the US state's new controversial religious liberty law. The singer issued a statement saying he could not "in good conscience" perform in the state. He added he found it "incomprehensible that LGBT citizens are being discriminated against". He was due to play the Mississippi Coast Coliseum in Biloxi on Thursday. Mississippi Governor Phil Bryant signed HB1523 into law on 5 April amid opposition from equal rights groups and businesses. The law offers protection for Christians who adhere to traditional views of marriage and gender roles, which Governor Bryant said "protects sincerely held religious beliefs and moral convictions". The new law will take effect from 1 July. Adams said he was using his voice to "stand in solidarity with all my LGBT friends to repeal this extremely discriminatory bill". "Hopefully Mississippi will right itself and I can come back and perform for all of my many fans. I look forward to that day." Adams's cancellation comes after Bruce Springsteen cancelled a show in North Carolina last week because of a new law in that state. Springsteen joined business groups in condemning the law which rolls back local anti-discrimination measures that protected gay and transgender people.